This is the fantastic deluxe edition of one of Nektar's best. It comes with a second disc of a more recent live account of them without including these two epic tracks, which is really just one two-part track. Prog and psychedelic factors meet with ease where Nektar are concerned, and this release captures them in all of that glory. I consider Nektar to be quite an under-rated throwback if there ever was one. This is not your typical prog. It takes more than a first listen to appreciate them, but once the ears get adjusted there is no mistaking their art. They can all be heard evenly by a warm mix in both the studio and live settings. Those who couldn't hear the guitar very well on earlier pressings will be glad to hear that has been fully corrected. Remember The Future has been released several times, but here it gets its best outing, by far. However I also recommend seeking out a copy of this on SACD which was released in 2004 and is a perfect pairing with this new deluxe version. I do have to note that I am not all that familiar with all that is Nektar, but with this release I have been enlightened and my interest rekindled, so I can recommend them with an urgency I would not previously have had. In many cases these deluxe editions tend to entice the consumer into another sale of what is usually not a whole lot more for the money, but this does include an entire disc of consistent bonus material. Some of the deluxe and tour editions by some acts are not as generous and tend to just have a mixture of various pieces that weren't released prior because they simply weren't considered good enough to make the cut This release goes above and beyond that. This features four parts, each with its own title but placed within “Part One.” The tracks are not easily divided so it's a case of blending the concept, and they nailed it all together so well. 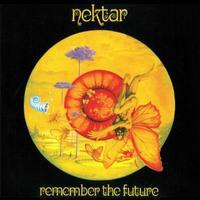 If you've never heard Nektar, this is, in my opinion their best work, so a great place to start. The vocals are outstanding and the rest follows. To otherwise describe what is going on, it would take a rather time consuming thesis. As things continue from here it gets into near Pink Floyd territory, for lack of a better way to explain it. I love the mention of the "eyes of the world" on this, a moment that somehow can't be missed. “Part Two” consists of six parts, all fitting under the sub-title. On this part the band stretches out more and enter much more familiar sounding territory. One must remember this was 1973 and Pink Floyd were dominating not only the prog world, but also charting very high as well. It cannot be expected that every prog or prog inclined band or artist even be found on the pop radar, but the great Floyd proved it could be mastered. The music displayed here on “Part Two” in retrospect could have been made room for in the mainstream as well according to my ears. The guitar in particular is much more in the picture than on “Part One,” and it shows a heavier side to Nektar. This is a listening experience to behold altogether, and stands right up there with some of the best 70s prog to be found. Never has an English act fit so well with the San Francisco sound, and that is another Nektar testament. This is one of two live bonus tracks of “Remember the Future,” and a great chance to hear this band play these two numbers a little differently, as they tend to swing them up a little bit. As the title suggests, this second bonus track is a live recording of the second part of “Remember the Future.” Again, it’s great to hear the changes the band make in this live setting. This cut, like the rest on this CD, is a more recent live recording from a Brazil concert. Things start with a heavy organ and go into a Bolero type drum beat arrangement that the band rely on until a lovely guitar takes them into a subtle vocal refrain. Apparently by the sound of things, Nektar have lost nothing. There is a little more up tempo action to follow and some slightly louder vocals before it comes to a halt. This is a great number and introduction to their ability to transcend their sound into a new era. Such an accomplishment is an impressive effort for anyone. This is where more evidence can be found of their impact and ability to cut through the mainstream barrier. The usual ups and downs in tempo and arrangement are intact as well. This also has a big majestic vibe to it. Relaxation and intense outbursts collide perfectly on this track. By the time it's over, the listener is completely hooked, and there is really just nothing lacking to point out. This one is a little more prodding, but that might be an illusion caused by a low vocal mix. One of the more noteworthy elements on this live track is the use of great drums, particularly the cymbals, provided by Nektar’s amazing percussionist Ron Howden. This is a massively infectious jam with fabulous guitar work throughout. This one comes right in with no delay between it and the last number. Once again they blend together with magnificence and it's hard to tell which track is which until repeated listenings. This ends with a huge amount of organ work, “majestic,” to say the very least. Getting down to a lower vocal register, this is a different mood than normally displayed by Nektar. They could name their own rollercoaster after this number, as it is all over the musical map of emotions. Vocalist/keyboardist Alan Freeman, in particular, puts on a spectacular performance, so much to the point where he is the star, if there is one. This is amazing! Now things go back up a notch, but the result is again the same, brilliant! It's amazing how they can take one to the brink of fantasy and then back to reality in one fell swoop. This is a power ballad of sorts. At least, if Nektar ever attempted such a thing, this would be it. There is a lot of great guitar filling here, too, from the exceptional Roye Albrighton. Just when things wind down they really sound like they're just getting started. This starts with some fantastic guitar work and goes right into a bluesy shuffle. Then after the first couple of verses, Alan Freeman flies on an organ solo that finds him and Albrighton matching vocal and guitar notes a bit here and there. This is not a typical Nektar style of jamming, but it sure does have a liberating effect. It’s sheer madness as they jam away and bring the house completely down. This is quite a surprise ending, especially with the raunchy guitar at the close.